Lucky Filters Don't Have to Light Ad 1968 This is a June 14, 1968 advertisement. It is a nice black and white ad from Lucky Strike.of the American Tobacco Company. Pictures a young woman with the wrong end of a filter cigarette in her mouth and it reads, Lucky Filters, you don't even have to light it to like it. In mint condition. Photo is taken through plastic and may show wrinkles or crookedness that is not in the ad. This magazine tear sheet measures 10 1/4"" wide by 13 1/4"" tall. 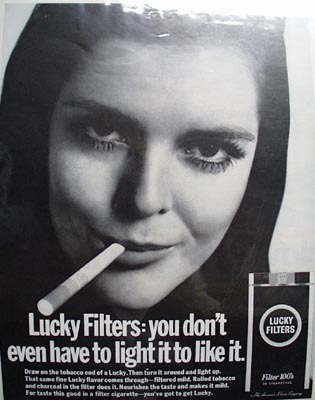 Items Similar To "Lucky Filters Don't Have to Light Ad 1968"